No matter how bold your expectations are, we deliver a unique Tel Aviv experience starting with our ideal location. 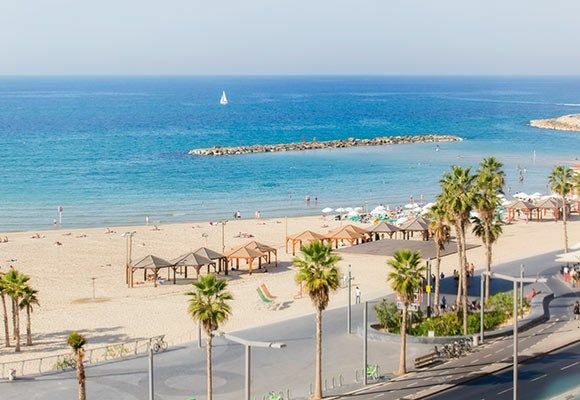 Centrally situated across from the City's Famed Tayelet beach promenade and celebrated Frishman beach, our 63-room hotel in Tel Aviv Reflects the City's heart, style and soul. Whether you are visiting Hotel Prima Tel Aviv for business or leisure, we are here to assure you a wonderful experience. From the minute you walk into Hotel Prima Tel Aviv, you will be greeted by the warm smiles of our staff and charmed by our elegantly designed lobby. Our design embraces Tel Aviv's unique styles by showcasing images of the City's world-Renowned Bauhaus architecture, artwork of famed local artists in a dynamic art gallery, and large murals of famous boulevards. Your travel experience would not be complete if it was not for our new, innovatively designed and highly praised Mediterranean inspired restaurant, Yaso. We invite you to enjoy breakfast every morning with us, overlooking the Mediterranean Sea. At our hotel in Tel Aviv, you will continuously sense the charm that drives our city.